What exactly is ‘not provided’ keyword? What the point is of measuring the impact of “not provided” keywords? How would you use this info to optimise your website or gain customer insight? What people are searching for to find your product? If you have a solid answer to this question, then you are on your way to get a very high conversion rate (provided you have the right landing page) from your search marketing campaigns. However the problem is, how do you find the keywords in the world of ‘not provided’ where Google is deliberating hiding almost all of the keywords data? Not provided keyword is a keyword without ‘keyword referral data’. The keyword referral data tells you which search term was used by a person on a search engine (like Google) to visit your website. For example, if someone visit your website by typing ‘web analytics training’ on Google, then the keyword referral data is ‘web analytics training’. Similarly, if someone visit your website by typing ‘google analytics bounce rate’’ on Google, then the keyword referral data is ‘google analytics bounce rate’. #1 The organic keywords referral data tells you which search term was used by a person to visit your website after he/she clicked on an organic search engine listing on Google. #2 The paid keywords referral data tells you which search term was used by a person to visit your website after he/she clicked on a paid search engine listing on Google. These paid search engine listing are the PPC ads you see on Google. Google has been hiding the ‘organic keyword referral data’ since October 2011 by encrypting its organic search data. This has been done in the name of protecting user privacy. But the real agenda of Google is most probably to force more marketers/advertisers to use Google PPC ads, as optimising search campaigns without keyword referral data is not very effective. Google does not hide the ‘paid keyword referral data’. It hides only the ‘organic keyword referral data’. 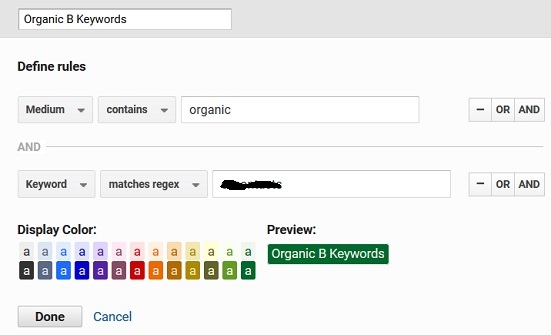 All web analytics tools (including Google Analytics) can no longer report the ‘organic keyword referral data’ from Google search engines in their reports. 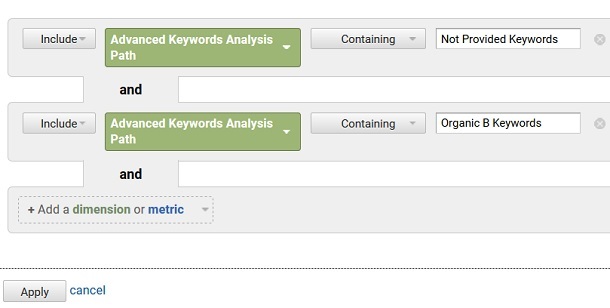 Google Analytics report ‘not provided’ in place of actual keywords in your organic search traffic reports. But since Google does not hide the ‘paid keyword referral data’, Google Analytics report the keywords which generated traffic, sales and conversions on your website through Adwords reports. You need to find alternate ways of uncovering new keyword opportunities. #14: Understand Searchers’ Intent & Capture it in the early stage of the buying cycle. 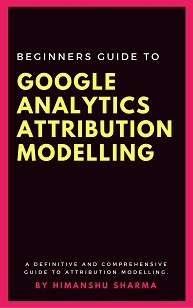 Many of you have been using Google Analytics for years. And in all of these years, your GA account has acquired tons of keywords data. Use this historical keywords data to determine keywords which have proved to generate traffic, conversions and sales for your website. Export this data and save it on your hard disk/cloud for future use. Google is not going to archive your historical data forever. So do it today. 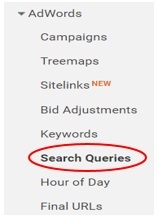 You may not know but SEMRush also provide keyword referral data. SEMRush update its database once a month and returns those organic keywords for a web page which are in its database and for which a webpage ranks in Google top 20. According to SEMRush, they analyze the rankings of 95+ million most profitable and popular keywords. SEMRush can be used to determine (not provided) data even today. Through tools like SEMRush you can determine the keywords (both paid and organic) which are generating traffic and revenue for your website or your competitors’ websites. If certain keywords have proved to be profitable for your competitors then they should be profitable for you too. Focus on keywords which have proved to work. Note: You won’t get all of the (not provided) data through this method. SEMRush analyses the rankings of only those keywords which are in its database. It is highly unlikely that Google or any search engine will ever hide the paid keyword referral data from advertisers. So run paid search campaigns on Google and Bing. Then target these keywords through SEO by developing contents around them. Note: There is no guarantee that what works for PPC, may work equally well for SEO. But by and large, this strategy works and it works really well. The ‘Search Console queries’ report provides lot of valuable keyword data. Through ‘Queries’ report you can determine the keywords for which your website is getting impressions and clicks. You can also determine average position and CTR for these keywords. 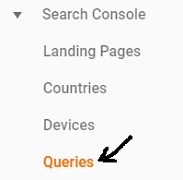 Note: If you can’t see any data in your ‘search console queries’ reports then it is because you have not integrated your Google search console account with your Google Analytics account. Such type of search is known as the internal site search as this search is taking place on your website. 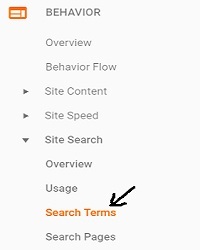 Now set up and configure site search in your Google Analytics account. You can get more details regarding this set up from this article: https://support.google.com/analytics/answer/1012264?hl=en-GB. This report will provide you with lot of valuable keywords data. You can then target these keywords by developing contents around them. Page level survey tools like Qualaroo can provide you with lot of valuable keywords data, provided you use these tools correctly. Not only does this question sounds odd but you won’t get many replies either. Were you able to complete your task? If not then why you were not able to complete the task? These two questions always provide me with lot of keywords ideas every single day. For example if you get lot of survey responses like “I was looking to get more details about conversion tracking through Google Tag Manager” then you know that you have to write an article which cover this topic in depth. Satisfy your visitors’ queries and you will get conversions. Page level surveys will also hep you in understanding searchers’ perception of your contents and brand. All of these data sources can provide tons of valuable keyword ideas. Sales and marketing people are in constant touch with existing and potential clients and the way they describe and sell their products is probably the way people talk about your products. You can get this valuable insight only through the offline data sources mentioned above. Many traditional keyword tools like Google Keyword Planner generally reports traffic only for fat head keywords (i.e. the keywords which seem to be getting high search volume). On top of that the tools’ search volume data is highly inaccurate. For example, Google is notorious for showing inflated search volume and this can be due to its vested interest to keep keywords competitive for possible high bidding by Adwords advertisers. It also fails to report all those keywords which have low or very low search volume. Every SEO campaign I have worked on gets majority of its organic search traffic through such low volume keywords (also known as the long tail keywords). Majority of traffic comes from long tail keywords. Still marketers remain busy targeting fat head keywords (like care insurance, travel London etc) as Google reports high search volume for them. If you had a monopoly over the top 1,000 search terms across all search engines (which is impossible), you’d still be missing out on 89.4% of all search traffic. So if you just rely on keywords tool like Google Keyword planner for your keyword research, you will miss out on a great deal of traffic which comes from targeting long tail keywords. And above all fat head keywords are extremely competitive and difficult to rank for. Your website may not rank for them for years. If you work with the mind set of targeting long tail keywords, you will no longer select keywords just on the basis of their search volume. You will select keywords which are frequently used by your visitors before they convert on your website. Just by reading a product description you can determine several relevant keywords for the product. This shirt will keep your long sleeves and your awesome style in place. Just by reading this description you can determine keywords like: long sleeve shirts, black shirts, white shirts, mandarian collar shirts etc. Your customers do not always use the search terms you think they use (or as Google Keyword Planner Tool suggest) to find your products. For e.g. you may be struggling hard to rank for the keyword ‘car insurance Southampton‘ while your client is in fact searching for the keyword ‘car insurance for young drivers Southampton‘. The former is competitive keyword and may not always produce best results in terms of sales or conversion as it can fail to meet the intent of a searcher who is looking for specific type of car insurance. Whereas the latter keyword is easier to rank for and can result in higher conversions or sales. Therefore it is very important that you understand how people describe your products and what they are looking for or are interested in. Product reviews on industry review sites. Reviews on product pages of your site. Comments on: industry news sites, journals and magazines. Product reviews on popular retail sites like ebay.com, amazon.com etc. Sales and marketing people are in constant touch with your existing and potential clients and can provide a great deal of keywords’ insight. The way they describe and sell their products is probably the way people talk about your products. The way people naturally link out to you, can tell a great deal about what they think of your product/brand. For e.g. if lot of people link out to your product as ‘cheap interactive whiteboard’ instead of ‘ 78 inch Gin interactive power board’, then you should seriously think of optimizing your product page for that keyword. You can determine the anchor text of your incoming links through tools like ‘open site explorer‘. Competitive analysis helps in all aspects of internet marketing and keyword research is no exception. However here by competitors I mean key industry players. The way they describe their products, choose keywords to target and the way people talk about their products can give you a good insight of ‘what to target’. Reviews on product pages of your competitors’ site and review sites. Their product catalogs, brochures and user guides. Sales pitch used by them in their marketing material and radio/tv/banner ads. Use SEM Rush tool to quickly determine which organic and paid keywords are actually driving traffic and sales to your competitors’ website. In keyword research the most important thing to consider is your searchers’ intent. What is their state of mind while they are performing a search. Are they searching to buy a product or are they searching to make a purchase decision? When it comes to determining searchers’ intent, the search data shows highest indicator of intent followed by demographic data and behavioral data. As a SEO it a wise to capture your prospects in the early stage of the buying cycle when they are making a purchase decision through keywords like ‘which is the best ….‘ or ‘where to buy ……‘. Such keywords are easier to rank for and you have less competition to face. But once your prospect is in the full buying mode, he will search for keywords which you may find very difficult to rank for, expensive to bid on and are predominantly captured by big brands like Amazon. That is why it is wise to capture your prospect early in the buying cycle esp. if you have got low marketing budget/resources. I have been using a new tool called ‘Keyword hero’ with great success and thought you will also benefit from it. ‘Keyword hero’ tool pull the search data from Google Search Console, use several data sources for keywords clustering & classification and then match it with the GA session data using some machine learning algorithm. ‘Not provided’ keywords do not fall into the category of either branded keywords or non-branded keywords. Therefore they deserve their own separate category and analysis called the ‘not provided’ keywords analysis. In a world of multi-channel marketing, people are exposed to multiple marketing channels (organic search, paid search, display, social etc) before they make a purchase or complete a conversion. Therefore it is important that we calculate the impact of ‘not provided’ keywords on all the marketing channels and not just on organic search. Before we start our calculations, we need to create a new ‘custom channel grouping’ in Multi-Channel funnel reports in Google Analytics. A channel label is the label applied to a digital marketing channel. For example ‘paid search’, ‘organic search’, ‘social’, ‘display’ etc are all examples of channel labels. 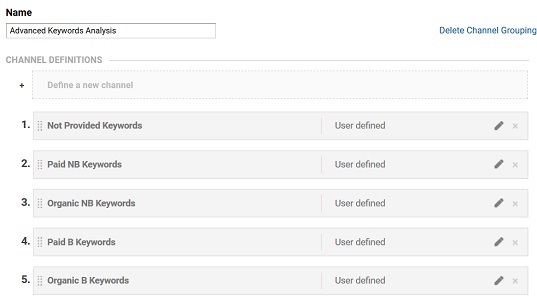 There are two types of channel labels in Google Analytics: Default Channel Labels and Custom Channel Labels. The default channel labels are the predefined channel labels. For example: ‘paid search’, ‘organic search’, ‘referral’, ‘display’, ‘email’, ‘social’, ‘direct’ and ‘other advertising’ are default channel labels. The custom channel labels are the labels defined by a user. Branded keywords and non-branded keywords are examples of custom channel labels. Channel Grouping is a set of channel labels. There are two types of channel grouping in Google Analytics: Basic Channel Grouping and Custom Channel Grouping. The ‘Basic Channel grouping’ is the set of predefined channel labels. The ‘custom channel grouping’ is the channel grouping created by a user. Step-1: Login to your GA account and then navigate to the GA view which contains at least 30 days of historical data. More the better. Note: If you use the keyword hero tool then use the GA view set up by the tool, as you will see more keyword data there. We are going to create 5 new channels in total for this custom channel grouping. 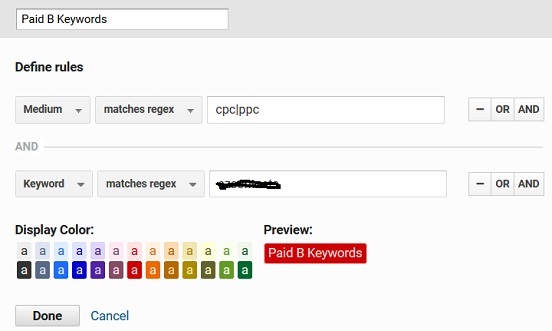 In the ‘matches regex’ text box, enter the regular expression which matches all of your branded keywords. Here we are defining all those keywords as branded organic keywords which contain your brand name in the keyword phrase and the medium of the traffic is organic. Since organic reminds me of vegetables, I have selected the color ‘dark green’ for this channel label. Step-7: Once you have set up the conditions for the rule, click on the ‘Done’ button. Step-8: Again click on the ‘Define a new Channel’ button. 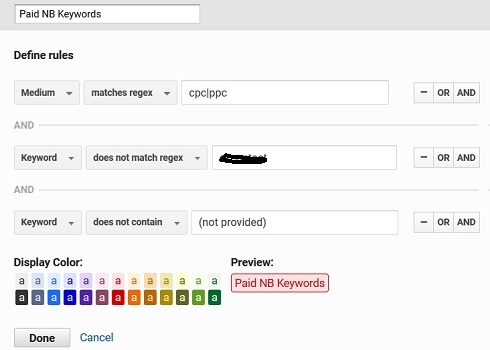 Here we are defining all those keywords as branded paid keywords which contain your brand name in the keyword phrase and the medium of the traffic is either cpc or ppc. Step-10: Once you have set up the conditions for the rule, click on the ‘Done’ button. Step-11: Again click on the ‘Define a new Channel’ button. the medium of the traffic is organic. Step-13: Once you have set up the conditions for the rule, click on the ‘Done’ button. Step-14: Again click on the ‘Define a new Channel’ button. the medium of the traffic is either cpc or ppc. Step-16: Once you have set up the conditions for the rule, click on the ‘Done’ button. Step-17: Again click on the ‘Define a new Channel’ button. Step-19: Once you have set up the conditions for the rule, click on the ‘Done’ button. Step-21: Click on the ‘save’ button. 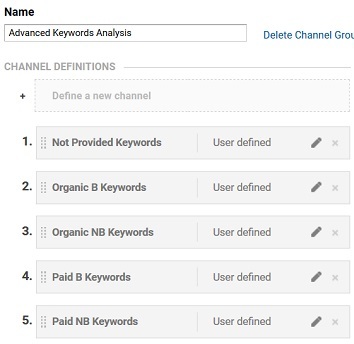 Step-1: Make sure that the custom channel grouping ‘Advanced Keywords Analysis’ is selected and you are viewing the ‘Top Conversions Paths’ report (under Conversions > Multi Channel Funnels) in Google Analytics. Step-2: Select the time period for which you want to do the analysis. Step-5: Click on the ‘Apply’ button. 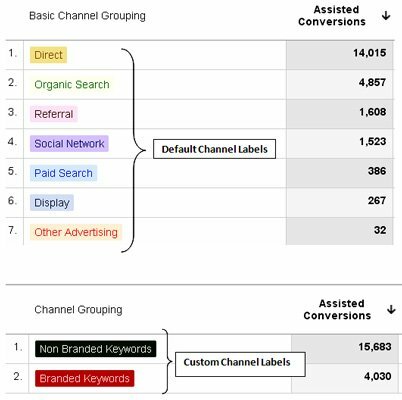 From the report you can determine all the conversion paths in which ‘not provided’ keywords played an important role along with the ‘organic branded keywords’ in initiating, assisting or completing a conversion. Without the role of the ‘not provided’ keywords in the conversion process, these conversions would not have occurred in the first place. Step-4: Click on the ‘Apply’ button. From the report you can determine all the conversion paths in which ‘not provided’ keywords played an important role along with the ‘organic non-branded keywords’ in initiating, assisting or completing a conversion. Step-3: Select ‘Source/Medium Path’ as secondary dimension. From the report you can determine all the conversion paths in which ‘not provided’ keywords played an important role along with the ‘direct traffic’ in initiating, assisting or completing a conversion. All you have to do is to make some changes in your advanced filter. 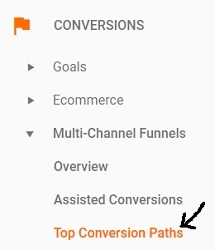 We can determine the assisted conversion and last interaction conversion values through ‘Assisted conversions’ report (under Conversions > Multi Channel Funnels) in Google Analytics. Step-1: Navigate to the ‘Assisted conversions’ report in your Google Analytics account. 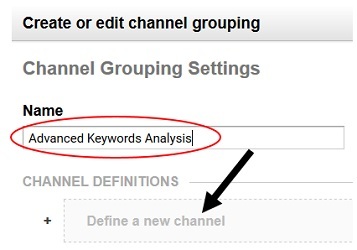 Step-2: Select the custom channel grouping ‘Advanced Keywords Analysis’. Step-3: Select the time period for which you want to do the analysis. 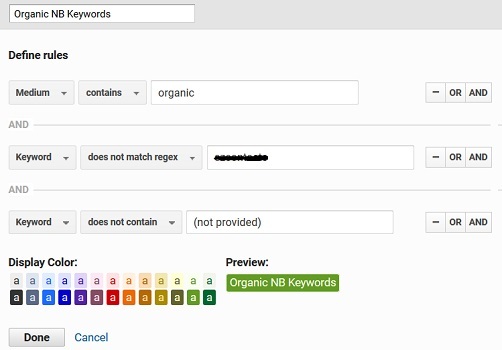 Step-4: Apply the on page filter ‘keywords’ so that you can see only the custom channels in your report. You can now determine the number of assisted conversions and last interaction conversions generated by ‘not provided’ keywords along with their conversion value. Just sum up the assisted conversion value and last interaction conversion value generated by ‘not provided’ keywords and you will get the total economic value generated by the ‘not provided’ keywords. Who would have imagined that the total economic value of ‘not provided’ keywords could be $62k? First of all, the point of any analysis is to gain insight. Once we get the insight, we then need to determine whether this insight is useful or not. Insights are generally useful because you get to know your business/campaign better. But what is even more useful is the ‘actionable insight’. Can we take any action on the basis of the insight we have gathered? In our case, the answer is ‘yes’. It is a common practice that before we fix a problem we assess the size of the problem. Yes ‘not provided’ is a problem. It is a big problem for marketers who rely on keywords to optimize their marketing campaigns. The first step toward assessing the size of the ‘not provided’ problem is to measure the total economic value generated by ‘not provided’ keywords. If this economic value is small or negligible for your business then you don’t need to worry about ‘not provided’ keywords yet. However, if the total economic value is large or very large or the performance of your marketing campaigns are deeply affected by ‘not provided’ keywords then you have got a work to do. For example, if only few organic branded conversions occurred because of the role of ‘not provided’ keywords in the conversion process then we can conclude that the majority of ‘not provided’ keywords are non-branded and our acquisition strategy is weak. We are targeting keywords which have low conversion potential for our business. This conclusion is based partially on the observations of customers’ online behavior over the years and partially on the assumption that majority of people eventually convert through branded keywords. People generally start their conversion journey by searching for non-branded keywords (provided they are not already familiar/loyal to your brand). But as their understanding of what they are looking for increases they refine their search queries. Also people rarely buy on their very first visit. They do comparison shopping, check websites for reviews; look for better deals before they make a purchase decision. So when they return to your website and convert, the source of traffic is generally either direct or branded keywords (because branded keywords are easy to remember). Because of this customers’ behavior, majority of conversions are attributed to direct traffic and branded keywords. So if majority of conversions on your website are occurring as a result of direct traffic and branded keywords then it could be a sign of a maintaining a strong brand image. Contrary to this if majority of conversions on your website are occurring as a result of non-branded keywords then it means you are either a new business or your brand retention is poor. These are some of the useful insights you can get from the analysis of ‘not provided’ keywords.